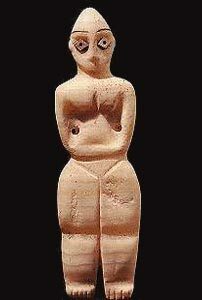 The Samarra culture (6000-5500 BC) was the second of the early Neolithic cultures which led ultimately to the creation of civilisation in Mesopotamia. 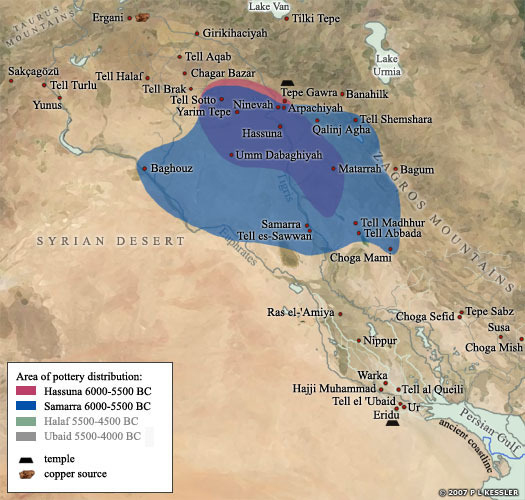 Contemporary with the Hassuna, it was based farther south in the mid-Tigris region, although there was a good deal of overlapping in the heartland of central Mesopotamia. Many Samarra settlements were located beyond the limits of the rain-fed zone, and it was in these areas that simple irrigation techniques, essential for successful agriculture, were first developed. 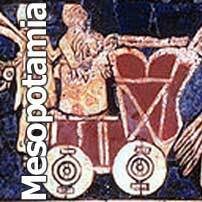 Farming gradually spread southwards towards the "neck" of Mesopotamia, along with the people who had developed this knowledge. They were perhaps a combination of recent immigrants and a possible low density population of foragers who were already there and who began to adopt agriculture. This area had less rainfall, so the development of irrigation became necessary in order to consistently produce quantities of food. Farming was based at least partially on this new idea of irrigation in a region which in general was too dry for reliable farming without it. With it, they were able to cultivate at least one crop that would not have flourished at all in the region. In the non-irrigated areas they were able to produce flax (linseed) for the fibres used to make linen cloth. Sites have been found in the areas where natural flooding could most easily be channelled and drained. These line up along contour lines, implying the creation and use of canals for irrigation, which itself suggests an intensification of farming since it had moved down from the rain-fed foothills. Such activity encouraged more investment in the land, a greater sense of permanence, and the possibility of land ownership. It also left villages with a greater vulnerability to attack so that they might have required some level of defence. Subsistence was based on cultivated wheat (emmer and bread wheat) and barley. The settlers kept sheep, goats, pigs, and cattle, and there was some fishing and shellfish gathering from the Tigris. Hunting and wild plant foods were also important, but agriculture had a bigger role. All this effort required a greater need for coordinated work and conflict resolution, but this can still occur in relatively small-scale societies, without any strong individual leadership or complex social organisation. 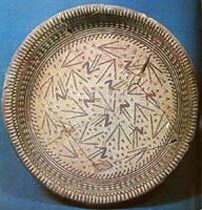 Samarra pottery was painted in a dynamic style, depicting dancing girls with streaming hair, goats, deer, scorpions, and many other animals. 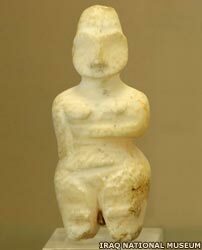 Highly sophisticated female figurines were also made, decorated with face paint or tattoo marks, and crowned with an elaborate coiffure. They were made using a tournette (also known as a 'slow wheel'), and possibly by specialists, suggesting that some individuals had already gained an element of freedom from the day-to-day labour in the fields, thanks to increased productivity. The largest settlements extended to about six hectares (fifteen acres); Samarra itself fits this description. Its population is estimated to have reached about a thousand - double the size of the largest Hassuna village. The Samarra T-shaped house building style may have been copied from the Hassuna culture, as there are similarities in both styles. Both used mud-brick and the Samarra houses consisted of multiple rooms with external buttresses, apparently originally to support corners and roof beams (these later become a decorative feature). Houses were set around open courtyards, and contained granaries, ovens, and kilns. The economy of the Samarra culture apparently had some complex features such as stamp seals (just as the subsequent Halaf culture did), and there are the possible marks of individual artisans on the pottery, suggesting a level of specialisation in the crafts. 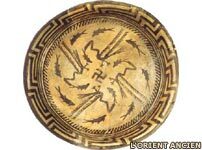 There are also exchange makers' marks, and a limited range of marks that are not part of the decoration, maybe indicating who made the vessels, who commissioned them, and so on. The need for such a level of marking is only required when there is a risk of mixing up individual items in shared kilns, where there is large-scale production and transportation to markets. The limited amounts of copper found in Samarra sites suggests there was a long-distance exchange, perhaps of pottery and surplus crop yields for copper. The site of Tell es-Sawwan, situated a short distance to the south of Samarra itself, had a population which probably reached several hundred (making it comparable to contemporary Jericho). Houses were relatively uniform in size and elaboration, suggesting that there was little variation in the social status of the occupants. There were also several large buildings containing up to seventeen rooms which might have been early temples, indicating a level of organisation or leadership and some sort of group activity and coordination, possibly for ritual purposes. These were the most elaborate community projects achieved so far, apart from Jericho's wall and tower. The site was surrounded by a ditch and contained a large number of baked clay balls which could have been used as sling missiles. This suggests there was a fear of raids. There were also at least 128 burials under several of the large buildings, including 55 infants, sixteen adolescents, and thirteen adults. The high proportion of buried children is typical for pre-industrial populations, which normally have a high infant mortality rate. Most were buried with at least one object, including alabaster female figurines, alabaster bowls, jewellery which included copper and turquoise beads, and ceramic pots. Only minor variations exist in the goods and houses which have been unearthed from this site (other than the possible temples), suggesting relatively minor differences in wealth between individuals. There is just one adult male burial which has several possessions. His was the sole burial in this particular room and may have been some kind of village leader. Overall, the burials here are richer than those from other contemporary sites, suggesting that some settlements or groups within settlements already had access to more wealth than others. By about 5900 BC (approximately a century after the first settlement there), a wall was built just inside the ditch with an L-shaped entrance path to make intruders vulnerable to fire from the tops of the walls. There must have been some risk of attack, probably for the food stocks. Another example of a fairly large, walled Samarra site is Choga Mami, on the southern edge of Samarra's influence. The remains of a disused canal system and finds of irrigated hybrid crops such as six-row barley, bread wheat, and large-seeded flax are the earliest evidence of irrigation so far discovered. As with Samarra, the site covered up to six hectares (fifteen acres) and contained up to a thousand people. Just like the later levels at Tell es-Sawwan, Choga Mami was walled and had an L-shaped defensible entrance and a tower guarding one entrance to the site. Defence was clearly a serious concern for the Samarra people, at least at some sites and in some periods. But the evidence shows that they were sufficiently organised to be able to build sizable defences, presumably indicating some sort of leadership, at least on a temporary basis. 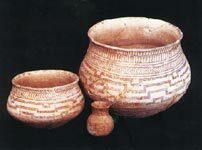 The late Samarra style was also contemporary with the beginnings of Halaf culture in upper northern Mesopotamia. Some overlapping also occurred in other places, where both styles can be found, and this may have been due to different ethnic groups in the region, or just different fashions. Samarra villages such as Tell es-Sawwan began to appear on the fringes of the alluvial southern plain much further south than before.